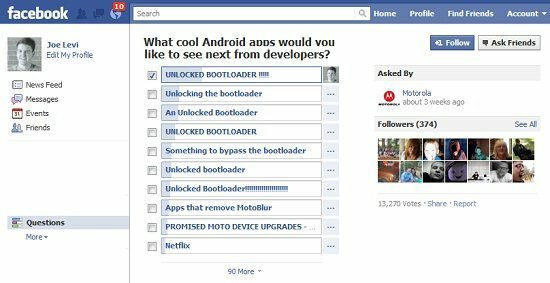 "What cool Android apps would you like to see next from developers?" This was the seemingly innocuous question Motorola posed to fans on their Facebook page, but the social media outreach attempt went wrong in the truest sense of the word. Being able to unlock the bootloader is the first step in rooting an Android-powered phone or tablet, so what the fans are demanding -- in essence -- is the ability to do whatever the hell they want with their phones without the help of Motorola. This to me is emblematic of the entirely weird and confused relationship between Android customers and manufacturers. They think they know what's best for us, but they clearly don't.